Kit Glover’s Insead team were one of only two crews to manage to pull together consistently good results to bring home the Cranfield Regatta trophy. With a win, two seconds a 3 and a 4, they beat a regatta field where a different boat won each race, and where only Insead and second placed Cranfield 13 managed to avoid finishing outside of the top 10 in each race. In the 20th edition of this regatta, 36 crews from 15 business schools made for dramatic starts and big differences in performances. The regatta was made up five races over two days in a fleet of identical Benneteau F40s. 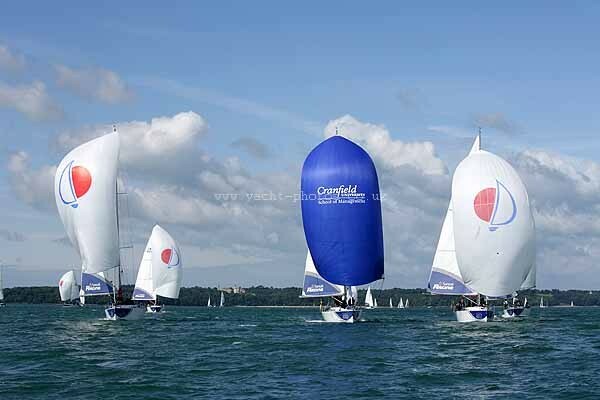 The crews spent Friday night in Port Solent, and Saturday night in Cowes on the Isle of Wight. Second place went to Cranfield 13, who also managed a first and a second, but discarded a 6th, and brought in a 3 and a 4 to finish 2 points behind. Third place went to Bocconi, on countback, having finished level on points with LBS, who ended up 15th in the last race. Glasgow round out the top 5.